The Mining and Exploration News in Mexico: Highlights on the Second Week of February, 2019. During the seventh week of the year (February 11th to February 17th, 2019), at least 32 press releases were announced by companies working in Mexico, with twelve communicating production results, seven informing on exploration results, six disclosing deals and corporate issues, three announcing financing rounds, three reporting on resources and development of their properties, and one discussing Mexican issues. ON MEXICO ISSUES, Michael Harvey, director of Corporate Affairs for GoldCorp declared that Zacatecas has lost attractiveness for mining. ON EXPLORATION, In Sonora, Silver One commenced a 1,000m drilling program at its Peñasco Quemado project, SilverCrest reported drill results and discover of the Babi Sur Vein within its Las Chispas project, and Silver Viper provided an update of the 2018 drilling program at its La Virginia project. In Chihuahua, Evrim and its partner, Harvest Gold reported drilling results from its Cerro Cascaron project, and Ethos received permits for trenching and drilling its La Purisima Au project. In Jalisco, Evrim reported drilling results from its Cuale project. In the State of Mexico, Candente commenced a drilling program to explore near surface drill targets at its El Oro project. ON MINING, Alio provided an update of the operation of its San Francisco mine in Sonora. Hecla reported Q4, 2018 production results from its San Sebastian mine and Avino reported full 2018 year production from its Avino mine in Durango. Capstone presented Q4 and full year 2018 production results from its Cozamin mine in Zacatecas. Santacruz Silver announced Q4 and full year 2018 production results from their Mexican operations. Telson released full year 2018 production results from its Campo Morado mine in Guerrero. Consolidated Zinc presented January 2019 production results from its Plomosas mine in Chihuahua. Fortuna reported and confirmed no contamination of soil at its San Jose mine in Oaxaca. ON FINANCING, Auxico closed a non-brokered private placement for gross proceeds of $400K (Zamora project, Sinaloa). Riverside announced a private placement to raise gross proceeds for CAD$1.5M (Cecilia project, Sonora). Magna Gold announced a proposed non-brokered private placement for gross proceeds of up to CAD$3.2M (Mercedes project, Sonora). ON RESOURCES AND DEVELOPMENT, Fortuna Silver announced results from the brownfield exploration program conducted at its San Jose mine in Oaxaca. Torex announced infill drill results from its El Limon Deep project in Guerrero. Bacanora Lithium provided an update of the H2 activities developed at its Sonora Lithium project in Sonora. Hecla increased mineral resource at its San Sebastian mine in Durango. ON DEALS AND CORPORATE ISSUES, Sonoro announced management appointments (Cerro Caliche, Sonora). Prospero Silver provided an update of its option agreement with Fortuna Silver on its Pachuca SE property in Hidalgo. Great Panther announced the approval from their shareholders to acquire Beadell Resources and change its name to Great Panther Mining Limited (Topia mine, Durango). Evrim granted 200K stock options to their employees (Cuale project, Jalisco). Magna Gold provided an update of its option agreement to acquire 100% interest on the Mercedes property in Sonora. Telson announced that they have identified a sophisticated concentrate theft from its Campo Morado mine in Guerrero during its transportation to the Trafigura warehouses in the Manzanillo port. Michael Harvey, director of Corporate Affairs for GoldCorp Inc., declared that Zacatecas has lost attractiveness for mining after the Supreme Court of Justice of the Nation (SCJN) declared constitutional 4 taxes called ecological (Extraction of Minerals, Emission of Gases to the Atmosphere, Emission of Contaminants to the Soil, Subsoil and Water and the Deposit and Storage of Residues) on the mining sector. It sends a very negative signal about the stability of the investment in Zacatecas. Silver One Resources Inc., commenced a 1,000m drilling program at its Peñasco Quemado project in Sonora. The drilling program will test three targets selected on coincidental geochemical and geophysical anomalies. The company will test two targets in the eastern part of the property: a) the down-dip extension of the drill defined historic Ag resource area, interpreted as a shallow southwest-dipping replacement manto, coincident with a low-intermediate resistivity anomaly, and b) the along-strike extension of the historic Ag resource area as identified by strong > 3 km long southeast trending Zn, Pb, Ba, and Mn in soil anomalies and partially coincident with geophysical anomalies. In the western part of the property, Silver One will test strong Zn, Pb, and Cu soil anomalies with coincidental geophysics in an area drill tested by Silvermex in 2008 where significant intersections were encountered as that in Hole PQRC51 with 4.5m of 340 g/t Ag at a depth of 88m from surface. SilverCrest Metals Inc., reported drill results and discover of the Babi Sur Vein within its Las Chispas project in Sonora. Highlights results are Hole BAS18-31 which intersected 2.2m (TW) of 18.78 g/t Au and 2,147 g/t Ag (3,556 g/t AgEq), and Hole BAS18-07 with 2.2m of 4.63 g/t Au and 209 g/t Ag (556 g/t AgEq). “The high-grade footprint of the Babi Sur Vein has been drill intercepted with 14 core holes over approximately 1.5 km strike length. Of the 14 intercepts with an average true width of 1.4 metres, six are greater than 400 g/t AgEq (400 to 3,555 g/t AgEq)”. Silver Viper Minerals Corp., provided an update of the 2018 drilling program conducted at its La Virginia project in Sonora. 4,753m were completed in 20 core drill holes, over five distinct prospect areas, distributed along 11km of the prospective structural trend. “The highlight of 2018 was El Rubi, a never-before drilled showing, located some 1.5km north of any previous drilling. El Rubi returned a best result of 6m true width (13.3m core length) averaging 3.16 g/t gold and 228g/t silver for a gold equivalent grade of 6.42g/t Au”. Ethos Gold Corp., received the approved permits for trenching and drilling its La Purisima Au project in Chihuahua. Ethos announced the commencement of the trenching program and expects to start the drilling program in March, 2019. The target area is at least 2km long and has not seen modern and systematic exploration. The company has estimated an initial and modest budget of approximately US$350K to conduct trenching and drilling at La Purisima project. Evrim Resources Corp., and its partner Harvest Gold Corp., reported drill results from their Cerro Cascaron project in Chihuahua. Nine core drill holes were completed at Serpiente Dorada, San Pedro, and Cascarita target areas for a total of 1,885m. Assay results have been received for only seven of the nine holes drilled to date. Significant drill interceptions were encountered in Hole SPT 18-01 (Serpiente Dorada target area) with 6.5m of 3.29 g/t Au and 6 g/t Ag, including 1m of 20.1 g/t Au and 22 g/t Ag, and Hole SPED 19-02 (San Pedro target area) with 4.8m of 1.02 g/t Au and 13 g/t Ag and 0.35m of 5.39 g/t Au and 24 g/t Ag. Evrim Resources Corp., released additional drilling results from its Cuale project in Jalisco. Evrim has received assays from ten core drill holes completed in 2018 for a total of 2,179m. Significant drill intersections were encountered in Hole GLR18-04 with 32m of 0.83 g/t Au from surface, including 22m of 1.06 g/t Au, and a deeper interval with 12m of 0.34% Cu; Hole GLR18-09 with 11m of 0.31 g/t Au from 36m downhole, and Hole GLD18-10 with 4m of 0.42% Cu from 136m downhole. Candente Gold Corp., begun a drilling program to test near surface drill targets at its El Oro project in the State of Mexico. “The Company remains committed to pursue drill targets previously developed on the San Rafael vein in the Mexico-Esperanza mine border area where three holes intersected high grades of gold and silver (30.7 g/t Au over 1.9m; 18.1 g/t Au and 137 g/t Ag over 0.4m, and 16.7 g/t Au and 32 g/t Ag over 1.4m) in the San Rafael and parallel veins as well as disseminated gold (1.0 g/t Au over 75m) in the overlying porous tuff horizon and has decided to develop more shallow targets as well”. The first target to be drill tested is the Cortaduras area which is about 6.5km west of the San Rafael vein and 5km west of the Veta Verde vein from which 6.4M Oz Au and 74 M Oz Ag (8M Oz AuEq) were produced historically in 4 mines. Alio Gold Inc., reported that 528,770 tonnes of stockpile with a grade of 0.31 were stacked on the leach pads. Au production for the month of January was consistent with Q4 production at approximately 3,890 Oz (subject to finalization and refinery adjustments). Alio also announced that they have sufficient stockpiles to operate at this capacity throughout 2019 while the company continues developing an engineered plan for recommencing mining activities. Hecla Mining Company, presented Q4, 2018 production results from its San Sebastian mine in Durango. Hecla processed 156,733 tonnes at the mill to produce 2.04M Oz Ag and 14,979 Oz Au. Avino Silver & Gold Mines Ltd., released full 2018 production results from its Avino mine in Durango. In 2018, the company produced 1.28M Oz Ag, 8,100 Oz Au, and 4.8M Lb Cu (or 2.8 M Oz AgEq). Capstone Mining Corp., presented Q4 and full year 2018 production results from its Cozamin mine in Zacatecas. In Q4, 2018, Capstone produced 9.3M Lb Cu for a total of 155.2M Lb Cu produced in the full year. Zn production in 2018 totaled 15M Lb Zn. Santacruz Silver Mining Ltd., announced Q4 and full year production results from their Mexican operations. At its Veta Grande mine in Zacatecas, Santacruz milled 36,719 tonnes of 81 g/t Ag to produce 58.9K Oz Ag, 113 Oz Au, 660.8K Lb Pb, and 891K Lb Zn. In the full year, 150,281 tonnes were milled with a grade of 73 g/t Ag to produce 190.3K Oz Ag, 367 Oz Au, 1.76M Lb Pb, and 2.5M Lb Zn. At its El Rosario mine in San Luis Potosi, the company milled 16,676 tonnes of 42 g/t Ag to produce 18.9K Oz Ag, 131 Oz Au, 89.6K Lb Pb, and 358.4 Lb Zn. In the full year, Santacruz milled 61,184 tonnes of 43 g/t Ag to produce 72.4K Oz Ag, 379 Oz Au, 286.7 Lb Pb, and 2.3M Lb Zn. Telson Mining Corporation, released full year production results from its Campo Morado mine in Guerrero. In 2018, Telson processed 585,601 tonnes of 1.02 g/t Au, 118 g/t Ag, 1.1% Pb, 4.3% Zn, and 0.37% Cu to produce 2,870 Oz Au, 622.3K Oz Ag, 4M Lb Pb, 36.3M Lb Zn, and 373.3K Lb Cu. Consolidated Zinc Limited, presented January 2019 production results from its Plomosas mine in Chihuahua. The company mined 3,530 tonnes of 10.3% Zn and 3.3% Pb to produce 813K Lb Zn and 262K Lb Pb, with metallurgical recoveries of 84% and 85% respectively. Fortuna Silver Mines Ltd., reported and confirmed that the overflow of the contingency pond at its San Jose mine in Oaxaca did not contaminate soils, and therefore no remediation is required. PROFEPA has already completed its investigation and confirmed the no contamination of soils from the overflow. Auxico Resources Canada Inc., closed a non-brokered private placement for gross proceeds of $400K (Zamora project, Sinaloa). Riverside Resources Inc., announced a plan to complete a non-brokered private placement to raise gross proceeds for CAD$1.5M. Net proceeds will be used to drill its Cecilia gold project in Sonora. Magna Gold Corp, announced a proposed non-brokered private placement for gross proceeds of up to CAD$3.2M. Fortuna Silver Mines Inc., reported results from the brownfield exploration program conducted at its San Jose mine in Oaxaca. The brownfield exploration program comprised 50.904m in 105 holes completed with up to six rigs in 2017 and 2018. Victoria is a primary target explored by underground drilling in which 27,302m in 53 holes were collared. Drill highlights include Hole SJOM781 with 13.5m (TW) of 119 g/t Ag and 0.57 g/t Au, Hole SJOM789 with 3m (TW) of 404 g/t Ag and 2.81 g/t Au, Hole SJOM794 with 6.3m (TW) of 213 g/t Ag and 1.24 g/t Au, Hole SJOM830 with 5.3m (TW) of 273 g/t Ag and 2.1 g/t Au, and Hole SJOM833 with 7.8m (TW) of 217 g/t Ag and 1.72 g/t Au. “Following the successful exploration results for 2018, the Company has allocated US$4.5 million to continued brownfield exploration at San Jose in 2019, including an estimated 11,500 meters of surface and underground diamond drilling and 450 meters of underground development for exploration drilling”. Torex Gold Resources Inc., released results of the first 32 holes of its infill drill program completed at its El Limon Deep Zone project in Guerrero, which is the downdip extension of mineralization below the El Limon open pit. Significant drill intersections were encountered in Hole LDUG-026 with 8.5m of 25 g/t Au, Hole LDUG-013 with 7.5m of 24.9 g/t Au, Hole LDUG-021 with 15.2m of 16.8 g/t Au, and Hole LDUG-002 with 45.9m of 12.5 g/t Au. Bacanora Lithium Plc., provided an update of the H2, 2018 activities developed at its Sonora Lithium project in Sonora. Bacanora has secured US$240M as part of the financing package to construct an initial 17,500 tpa Li carbonate operation and continues discussions with industry and strategic financial parties with regards to completing Sonora’s finance package. The company also obtained and unrestricted access to develop and operate the Sonora mine secured following acquisition of La Ventana and La Joya mineral concessions for US$2.9M with the final consideration settled in August 2018. The processing plant sites change of land use permission was approved and augments the Manifestación de Impacto Ambiental (MIA-Environmental impact assessment permissions) for the project and the MIA for permanent road construction previously approved in 2018.These developments enable the project to commence construction, immediately after the project financing package is completed. Hecla Mining Company, increased reserves and mineral resources at its San Sebastian mine in Durango. Proven reserves are 22,000 tonnes of 121 g/t Ag and 2.48 g/t Au (85K Oz Ag and 2K Oz Au contained), and probable reserves are 206,000 tonnes of 407 g/t Ag and 3.11 g/t Au (2.7M Oz Ag and 21K Oz Au contained). Total proven and probable reserves are 228,000 tonnes of 382 g/t Ag and 3.11 g/t Au (2.79M Oz Ag and 23K Oz Au contained).Indicated resources at San Sebastian are 2,243,000 tonnes of 202 g/t Ag, 1.55 g/t Au, 2.5% Pb, 3.5% Zn, and 1.6% Cu (14.7M Oz Ag, 115K Oz Au, 68.12M Lb Pb, 95.7M Lb Zn, and 44.3M Lb Cu contained). Inferred resources are 3,487,000 tonnes of 205 g/t Ag, 1.24 g/t Au, 1.7% Pb, 2.5% Zn, and 1.3% Cu (22.9M Oz Ag, 143K Oz Au, 27.1M Lb Pb, 39M Lb Zn, and 19.9M Lb Cu contained). Hecla also presented Q4 2018 drill results conducted with three core drill rigs and one RC drill. One underground drill rig completed in-fill drilling in the central and upper portion of the oxide zone along the Middle vein. Additionally, two core drill rigs tested shallower oxide mineralization along the West Francine, Esperanza veins and El Toro vein. Highlights drill results at the Middle vein are 3.6m of 2,080 g/t Ag and 6.84 g/t Au, at West Francine are 0.43m of 295 g/t Ag and 0.62 g/t Au, and at El Toro vein are 3.6m of 305 g/t Ag and 4.04 g/t Au, and 3.05m of 127 g/t Ag and 4.04 g/t Au. Sonoro Metals Corp., announced the appointment of its Executive Director and Corporate Secretary (Cerro Caliche, Sonora). Prospero Silver Corp., announced that TSX approved its option agreement with Fortuna Silver Mines Inc., in which Fortuna can earn up to 70% interest in the Pachuca SE property in Hidalgo. Great Panther Silver Limited, announced the approval from their shareholders to acquire Beadell Resources Limited and to change its name to Great Panther Mining Limited. Evrim Resources Corp., granted 200K options to their employees. The stock options are exercisable at a price of $0.32 per share for a period of five years. Magna Gold Corp., provided an update of its option agreement on the Mercedes property in Sonora, to acquire 100% interest in two mining concessions for a four year period. These mining concessions cover approximately 345 hectares and Magna is entitled to acquire 100% interest by paying to the seller an aggregate of US$1.34M plus VAT of 16% in installments commencing on the 6th month from the effective date, and ending on the 48th from the effective date; issue to the seller 3% NSR capped at US$3.5M and subject to the right of Magna to acquire all the NSR at a price of US$0.5M per percentage point within the first three years of commercial production of the Mercedes property, and conditional on the completion of a going public transaction within six months of the effective date, issue 2,442, 105 common shares. Telson Mining Corp., announced that the company has identified a sophisticated criminal operation to intercept concentrate trucks, remove some part of the Campo Morado concentrates and replace the same with lower quality concentrates. Now the company has taken measures to eliminate this issue with increased security including performing monitored and guarded concentrate transport from the mine to point of sale. 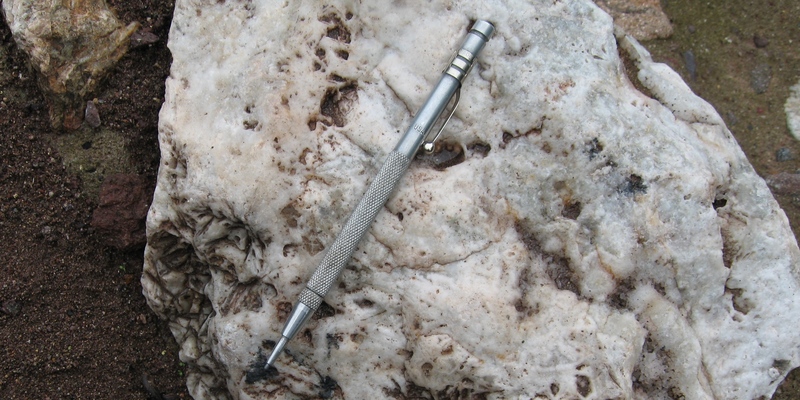 On the picture above, “quartz blade” texture in a low sulphidation epithermal vein system in a prospect in Jalisco, Mexico. Photo by Miguel A Heredia.